Those who love working with animals and have a passion for improving the health and welfare of pets and animals will thrive in a career as a veterinarian or veterinarian technician. Veterinary schools offer comprehensive degree programs that teach students how to diagnose, treat, and immunize all types of animals. This guide provides an overview of veterinary careers and degree programs that set the stage for this exciting career path. Dr. John Patrick Smith is a 1989 graduate of Auburn University, College of Veterinary Medicine. He practiced at Tyrone Veterinary Hospital in St. Petersburg, Florida, for three years before pursuing his dream of owning his own veterinary hospital. In 1994 he opened Curlew Animal Hospital in Palm Harbor, Florida, where he serves today as the hospital’s sole practitioner. Veterinary professionals play a vital role in maintaining the well-being of sick or injured animals, whether they are veterinary technicians, attendants, doctors, or another role within this field. However, before one can enter a career in veterinary sciences, they must complete the required level of education for their desired profession. To help with this process, we have carefully analyzed every veterinary school and program in the country to find the best academic options for prospective students. 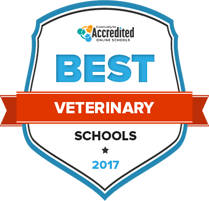 Explore the top veterinary schools and programs for 2017 here. Accredited veterinarian schools require students to take a combination of science courses and complete laboratory-based coursework. At the undergraduate level before applying for veterinary school, students complete advanced courses in biochemistry, chemistry, and mathematics along with labs. Students who meet the undergraduate course requirements can apply to veterinary school to earn their Doctor of Veterinary Medicine degree and state license. accepted full-time positions earned more than $31,000 annually. grow 9 percent through 2024, which is faster than the average for all occupations, according to the U.S. Bureau of Labor Statistics. wage for veterinarians was $87,590 in May 2014. Veterinary technician programs provide students with technical skills and knowledge to work alongside veterinarians to perform various procedures while providing care for different types of animals. Coursework typically encompasses anatomy and physiology of domestic animals, pharmacology, and an externship component. Completing a biology degree program provides the educational framework for careers in the healthcare and science field. Students study topics like anatomy, microbiology, chemistry, and ecology. These programs can serve as the undergraduate portion of a veterinary doctor’s education. Medical billing and coding jobs are more technical in nature and require long hours at the computer processing paperwork and creating reports. Students can complete vocational training or a degree program at an accredited trade school, community college, or four-year university. Students learn technical skills, such as how to dispense drugs, basic veterinary clinic operations, and how to use various types of technology and specialized equipment. Many two-year programs also include an internship component where the student works at a local veterinary clinic or other partner facility to obtain hands-on experience. Courses completed at this level can also serve as foundational coursework for bachelor’s and advanced degrees in veterinary science, or can open the doors to entry-level positions as veterinary technicians or technologists. Associate’s degree programs include courses in animal biology, nutrition, and veterinary medicine. These courses provide a strong knowledge base for those who want to work as a veterinary technician or continue their educations. Find detailed course descriptions below. Fundamentals of anatomy of domestic animals so that students know how to identify different anatomical regions and use appropriate topographical terms when communicating with supervisors and clinical staff members. Physiology of domestic animals and the link between certain aspects of physiology and the pathogenesis of certain diseases. In-depth study of principles and practices related to veterinary pharmacology and pharmacokinetics. Includes applications of pharmacology principles in the small practice setting. Focused on the technical clinical aspects of animal care in the laboratory setting, including how to handle and restrain different animals, diseases, and appropriate nutrition principles for laboratory species. Graduates of bachelor’s degree programs in veterinary science are trained to serve as health care providers for small animals and as biomedical scientists. However, they are not yet qualified to practice medicine. At this level of study, students learn how to solve medical problems related to small animals, gain core biology and chemistry knowledge, and study the link between nutrition, environment, and animal behavior and disease. Completing a four-year degree is a pre-requisite for admission to a doctor of veterinary medicine program. While students may opt for a pre-vet degree or a closely related track, the main goal during undergraduate studies is to complete the pre-requisite courses for vet school. At the undergraduate level, students can major in whichever subject they like, so long as they make sure to complete the necessary science and math courses to move on to advanced veterinary medicine programs. Covers the basic principles of drug development, pharmacology and applications. In-depth study of the principles of disease control pertaining to animals and the analysis of causes and effects of certain conditions. Study of and applications of disease management and prevention on laboratory animal colonies. An introduction to diseases affecting wildlife and how these impact both domestic animals and humans. Doctor of veterinary medicine programs teach scientific principles related to animal behavior, anatomy, pharmacology, and other subjects. Many schools offer several programs of study where a student specializes in a certain field of medicine, such as infectious diseases, physiology and pharmacology, population health, and small animal medicine and surgery. Courses are more theoretical in nature but some coursework is completed in a lab setting so students can apply their knowledge. They can prepare students to meet state licensing requirements to practice medicine. An integrated approach to the study of animal medicine, surgery, anesthesiology practices, radiology, and other topics. May include a combination of lectures, lab work, and demonstrations. Provides clinical experience for the administration of anesthetics in animals safely and effectively using modern techniques. Ethical issues related to the administration of veterinary medicine, including clinical operations and genetics counseling. Prepares the student for clinical rotations at an area hospital or clinic. Procedures and protocol include fluid administration, IV and IM injections, and IV catheterization practices. The Association of American Veterinary Medical Colleges (AAVMC) accredits all 30 veterinary medical colleges in the United States. Veterinary schools can also join the American Association of Veterinary Medical Association’s Council on Education (AVMA/COE) which accredits DVM and similar higher level programs. Determine how many faculty members are practicing veterinarians or have worked in veterinary medicine. These staff members can share valuable real-world insights and serve as a source for a recommendation when applying for a job or other educational opportunities. In order to take the North American Veterinary Licensing Exam (NAVLE), applicants have to graduate from an AVMA/COE-accredited college. Attending schools that offer NAVLE preparation courses can increase the chances of passing the licensing exam the first time. Schools that offer opportunities to meet doctors, veterinary professionals, and industry leaders at networking events or professional presentations throughout the year may offer more value to an ambitious student. These events give students a chance to interact with established professionals, learn more about the industry from an insider, and develop their professional network. In addition to the role of a veterinarian, there are several supporting and related careers that graduates of different levels can choose from. Responsible for the care and treatment of animals compliant with ethical rules and state regulations. Veterinarians are directly involved with diagnosing and treating the medical conditions and diseases of pets. They may also work with livestock and other animals to provide comprehensive veterinary care in a field or clinical setting. Responsible for taking care of animals in a lab, clinic, or hospital setting before or after the animal is being treated by a veterinarian. They provide support services to other veterinary professionals to ensure the animal can stay calm and relaxed during visits. May also be involved with making sure that animals stay still while undergoing surgery. Responsible for performing all medical tests and lab work under the supervision of a licensed veterinarian. The test results are used to diagnose medical conditions, injuries, and illnesses. Since this role is more technical in nature and requires strict compliance with clinical procedures and practices, the technologist or technical must be registered, licensed or certified, depending on state guidelines. pediatrician, hematologist, oncologist, and many more. You also have to manage people, both employees and clients. I find that this job requires that you be a people person. Explaining why a pet is failing or what we need to do to fix a patient who cannot speak for themselves, to a worried mom and dad takes dedicated time. Now I find that helping people is as rewarding as helping a pet. The American Veterinary Medical Association recognizes 22 veterinary specialties that focus on specific areas of the discipline. Each of the following specialties maintains their own organization under the umbrella of the AVMA and may offer their own membership, certification and research opportunities. In order to practice as veterinarian, you will need a license. Licensing requirement vary by state, but generally you will need to graduate from an AVMA-accredited veterinary school and pass an exam. Veterinarians need to be able to resolve complex health problems affecting the animals they treat with appropriate solutions. They may need to turn to personal experience or seek out resources to diagnose and treat animals suffering from a disease or injury. Most veterinarians and veterinarian technicians work in a clinical setting or lab environment with a team of medical professionals. They need to be able to communicate clearly and maintain a professional demeanor at all times. They also need to convey information accurately and in a timely manner to ensure accuracy of medical records and to maintain clear communications with animal owners. All health and medical professionals are required to abide by a set of ethics and maintain a high degree of professionalism. They must refrain from disclosing sensitive information and understand the dynamics of relationships with clients (the animal owners) and fellow staff members. Those in managerial roles, such as animal clinic managers and doctors, need to have strong leadership skills to ensure all team members are contributing in the most effective way. They may be involved with making critical decisions pertaining to an animal’s health and well-being, as well as leading and training teams of other veterinary professionals. Veterinarians and health care professionals must use scientific rules and methods to solve problems. Inductive reasoning may be needed to form a conclusion or diagnosis but applying fundamental scientific rules and protocols when treating different animals is critical for the ethical care and surgical treatment of animals in a clinical setting.